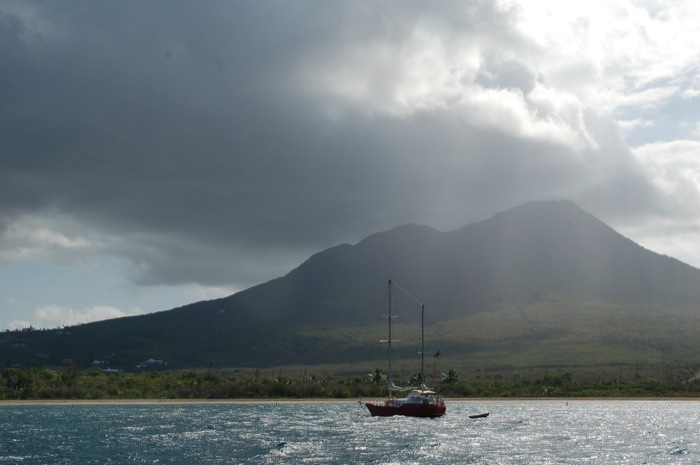 Nevis lies so close to Antigua that the one is clearly visible from the other. Despite this, our passage from Jolly Harbour to Charlestown took more than 24 hours. Perhaps that’s what comes of setting forth on April the 1st. The first 15 hours of our journey were spent drifting sideways, just a stone’s throw from the anchorage, watching turtles swim past under the boat. The night which followed was spent limping along into a light westerly – a westerly, for heaven’s sake! 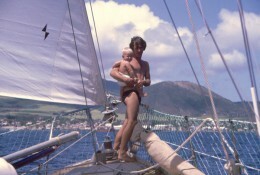 Would the anchorage off Nevis even be tenable in this wind, we wondered, or would we have to go to St Kitts instead? 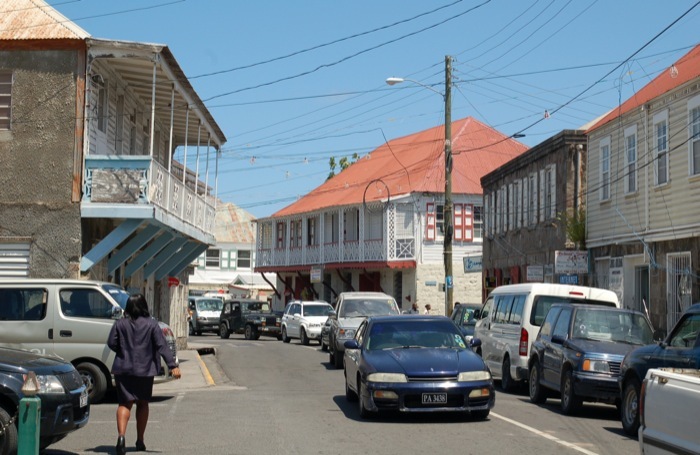 St Kitts and Nevis – properly, St Christopher and Nevis – were joined together when Britain decided it was time that they stood on their own two feet. Anguilla was also a part of this new union, but only very briefly. When the folk there learnt of their fate, they rebelled. In a spectacular misreading of the situation, Her Majesty’s Armed Forces were immediately sent in to restore law and order and proper governance, etc, etc. Specifically, thirty paratroopers carrying sub-machine guns and a bazooka were dropped from the sky, one dark night, onto the ploughed fields of the island’s interior. Their orders were to surround and subdue the capital town. One can imagine the soldiers’ confusion when they discovered that the said town consisted of three shops set, incongruously, in the middle of nowhere. Happily, since the lads couldn’t find anything revolting to put down no harm was done, (except to Britain’s credibility). Anguilla was thereafter allowed to revert to British possession, and St Kitts and Nevis have had to make the best of things without her. Nevis is home to Paul Johnson‘s dearest friends, John and Gill Frith. They met while he was passing through Bermuda, some forty years ago, and promptly fell under the vagrant’s spell. There he was, coming and going as he pleased: a romantic water-hippy; a salt-sea Traveller; a man of no fixed abode with no money and no plans but with a visible sense of fulfilment and achievement beside which the life of a rich business man with too many toys seemed unutterably futile. Like the pied piper, Johnson led the young couple and several of their friends away from the path which their parents had pointed out to them. They threw in their office jobs; they built boats just like his; and then off they went, following in their messiah’s wake, into the wide blue yonder. Johnson and the Friths sailed 35,000 miles in company, in Venus and Moon, before John and Gill turned their backs on the cruising life. And even then they didn’t manage to settle down. Having washed ashore they found themselves still itching to travel, and so they now have moorings (as it were) in three places: in their homeland of Bermuda, in Nova Scotia, and in Nevis. The Frith’s hill-top house in Nevis looks towards Antigua, and so they expected to see their old friend, in his gaff-rigged ketch, arriving from over the sea. But as it happened our approach was made under cover of darkness. During the calm of the day before Cherub had somehow contrived to drift northwards while we drifted south, so that by nightfall the two boats were five miles apart. The easterly, when it came, carried Mollymawk to the southern end of the island; and then it promptly vanished. For half an hour we sat and swilled about, and then, just as the sun was pushing its pale yellow fingers over the rim of the eastern horizon, there came a southerly puff. 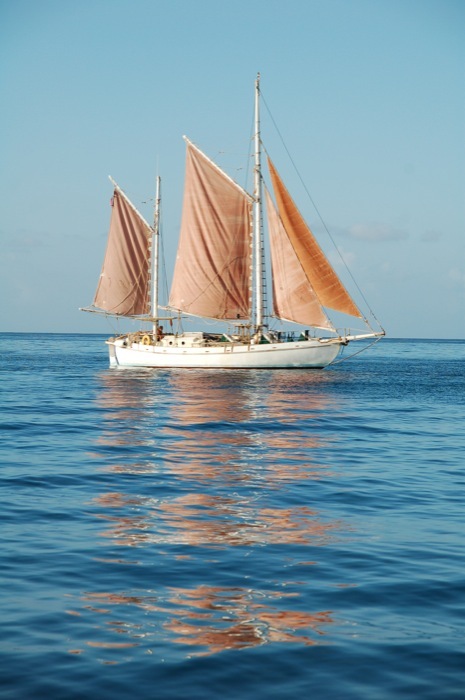 For a scant minute we smelt the sulphur stench of the dragon’s breath, borne all the way from Montserrat, and then the breeze swung into the north-east and hauled us up into the anchorage. Cherub duly arrived an hour later, having had to cover that extra five miles. Nevis does not have a harbour, as such. 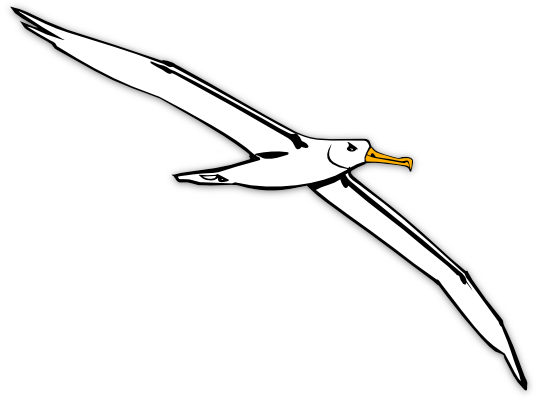 The anchorage – off Pinney’s Beach – is an open roadstead secure only when the wind is east of north. Fortunately, the winter wind seldom wanders into the west. 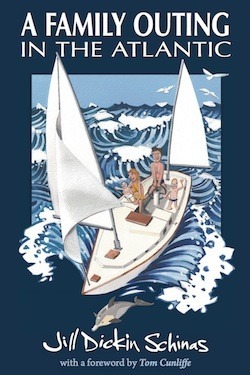 In past times Pinney’s was a lovely place – a glorious white strand, lapped by lacy white foam and backed by a forest of tall palm trees – and one used to just sail in and drop the hook wherever one pleased. Alas, things have now changed. For a start, the anchorage is no longer so picturesque because the palm trees have all been killed. A developer bringing in more trees for his fancy hotel inadvertently introduced a pest, and this has swiftly infected most of the coconut palms on the island. Thus, Pinney’s Beach is now backed by a forest of black trunks. Not so pretty. Worse still so far as visiting yachtsmen are concerned, the powers that be, in their wisdom and greed, have now filled the bay with moorings. Somewhere in the region of 80 large white buoys now lie in depressingly orderly ranks off the beach. Heaven only knows when such a number could ever be needed. 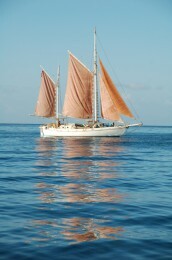 During the week of our stay there were never more than eight other boats here, including Cherub. One wouldn’t mind the moorings quite so much if only they had been arranged in a more artistic manner – in haphazard groupings, perhaps, according to the manner in which a bunch of boats normally adorns a patch of water, and using a variety of colours for the buoys – and one wouldn’t mind them at all, I suppose, if only one didn’t have to pay for their use; and if only they were safe. You can get away with ignoring the moorings, and dropping your anchor in the midst of the throng – but you still have to cough up! In other words, this is a racket. Yotties who don’t like walking should visit Charlestown before they anchor off Pinney’s Beach, because this is where the Customs people make their abode. Folks who are not too decrepit to toddle half a mile and who want to see their new surroundings might just as well go directly to Pinney’s, come ashore on the beach, and stroll into town to do the paperwork. The authorities are to be found in a converted warehouse at the root of the ferry dock. The lower floor of the warehouse and various other small buildings in the vicinity are occupied by souvenir shops. Customs and the Port Authority reside upstairs, in adjacent offices. Customs are the folk who want to see your papers. The Port are the people who want you to pay for the use of the moorings that (we assume) you are not using. Thus, the correct procedure is to visit Customs, tip-toe back past the Port office… and hope for the best. Having visited the Customs people one then has to walk (200 yards or so) to the police station. The immigration officer makes her home upstairs, in an icy cold, air-conditioned cubicle. In short, Nevis is almost boring. Perhaps that’s why it attracts so many ex-pats. The quietude contrasts very favourably with the rattle and roar of Western civilisation. No drone of traffic passing on the road, no aircraft whining overhead, no clatter of feet on a busy pavement, no throng of bodies in the hypermarket while you buy your groceries for the week. And no sour faces; and no winter winds. Just a life of endless sunshine shared with a pleasant people. 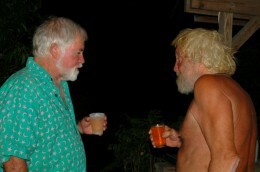 But from the visiting yotty’s point of view, Nevis is a bit of a non-event – until you make friends. Making friends is what cruising is all about, really. There is a limit to how much culture and beauty one can absorb. There’s a limit to how many Sites of Outstanding Interest a person can really find outstandingly interesting in one fortnight, and even pretty scenery is not enough, in itself, to keep her happy indefinitely. But one can never have too many friends. 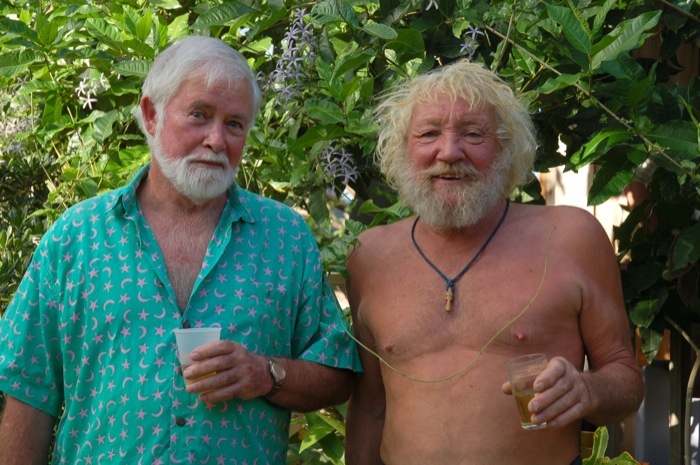 Of course, on this occasion we were fortunate enough to have a whole gang of ready-made friends, in the form of John and Gill Frith and the colourful array of folks whom they invited to Johnson’s Official Welcome-Back-to-Nevis Party. Star performers here were Steve and Irene, and their lovely daughter Pearl, from the charter yacht Star. Another popular showing was the troop of vervet monkeys which spent the afternoon stealing fruit from the trees and even -at one time – running along the verandah which surrounds the house. Roxanne spent a long time stalking various individuals of the monkey family, each in succession. Her hope was for a quick cuddle – but monkeys are not very cuddly. Having studied her from aloft with their huge, intelligent eyes, they would suddenly swing through the trees or scramble off over the roof or drop down and run off, scolding angrily. In an effort to persuade them of her friendly intentions the naturalist put out offerings of apple. This was appreciated by the monkeys – one youngster skipped down the tree, snatched up the offering and then, having returned aloft, lay on his back on a bough, tucking in – but the larger, trousered and beskirted primates in the company expressed horror and disapproval. Monkeys are a bit of a problem in Nevis. Someone introduced a few brace, more than a hundred years ago, for a laugh, and the descendants of these first arrivals now number 10,000. This is exactly equal to the number of people residing in the island. Until fairly recently the monkeys kept to themselves, hanging out in the forest and living on wild fruits and berries, but they have now discovered that the best and biggest produce grows around the edifices erected by Homo sapiens. As a result, no member of our own species is now able to harvest any mangoes, papayas, avocadoes, soursops, or granadillas. We were disturbed to see sharp-shooters walking around in the forest hunting for monkeys. However, the fact of the matter is that the monkeys are a serious problem. For many of the people living here, the fruit from their gardens is not a luxury; it’s an important part of their diet. In short, either the monkeys go, or the higher order of apes goes hungry. Humanitarian issues are seldom straightforward. As it is, nobody is eating the meat from the monkey cull; it is just destroyed (or so I was told). Now, I, personally, certainly couldn’t bring myself to eat a monkey – but then I don’t eat pigs or cows or sheep either. Twenty years ago, when I first visited the Caribbean, monkey was actually on the menu in various restaurants in the islands – along with iguana, and turtle, and various other local delicacies – but pressure from appalled (and completely ignorant) Westerners has put paid to that. I was (and still am) one of the appalled – but the fact is that our squeamish attitude is at odds with the law of nature. Killing the monkeys and then not eating them doesn’t make any sense at all! Ecological issues are never straightforward. Yotties arriving friendless in Nevis need not remain that way for very long. Good company – together with excellent food and plenty of booze – awaits all-comers at the Double Deuce. 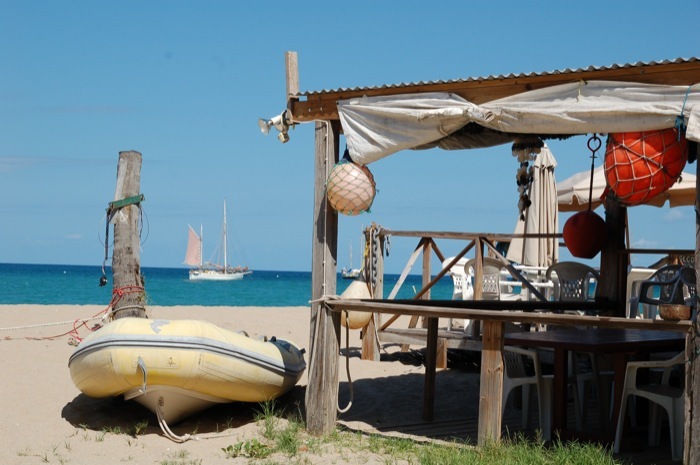 This beach-bar restaurant stands in the southern corner of Pinney’s and serves as an unofficial clubhouse for passing yotties. If you have ever visted the Azores or St Helena (in the South Atlantic) you will know the kind of thing I mean: the Double Deuce is equivalent to Peter’s Cafe Sport in Horta, or Ann’s Place in Jamestown. 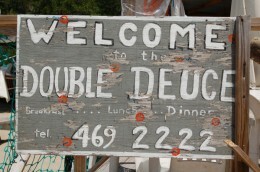 In fact, the Double Deuce is actually better than either of those two famous venues. For starters, it belongs to an amazing woman – Lindita – whose husband just happens to be an amazingly good chef. Mark came to Nevis, from England, to work at one of the small but very fancy hotels. Haute cuisine is his vocation and his passion; he’s even planning to open a School of Culinary Training on the island. 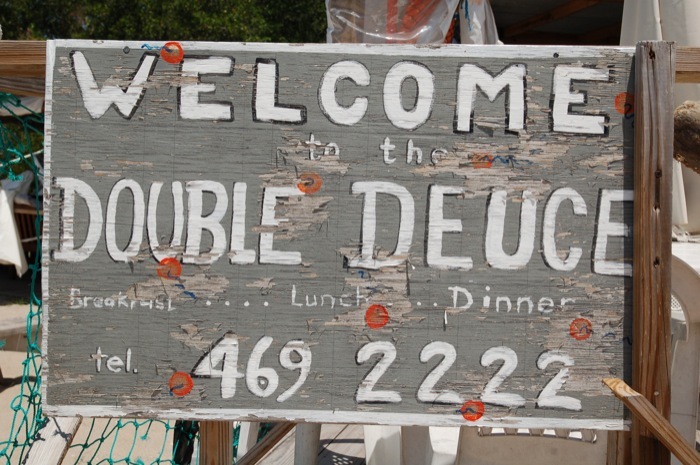 Secondly – and in recognition of the quality of both the cooking and the management – the Double Deuce is the favourite haunt of a good many island-born locals and also of the ex-patriots. 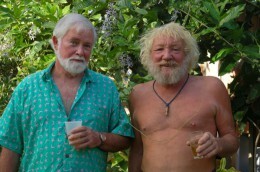 In short, this is the number one place in Nevis to get to know people. Monday night is karaoke night at the Double Deuce. So don’t say I didn’t warn you. This crew likes nothing better than a good ol’ sing-song… but karaoke is not that; not in our opinion. Karaoke is an ego-trip inflicted by the few upon the many innocent bystanders. The only proper place for a karoke evening is in the privacy of your own home, amongst a roomful of mellow friends, with everyone joining in. In retrospect, I’ve a suspicion that this is a actually a fairly accurate description of a karoke evening at the Double Deuce – because, after all, everybody here knows everybody else – but at the time we were not willing to take the risk; we arrived at the Double Deuce at about midnight, two hours after the place was officially closed for business. The Double Deuce looks all set to become one of those places that you really have to have visited, if you’re passing this way – rather like Shirley Heights (Antigua), or those aforementioned bars. 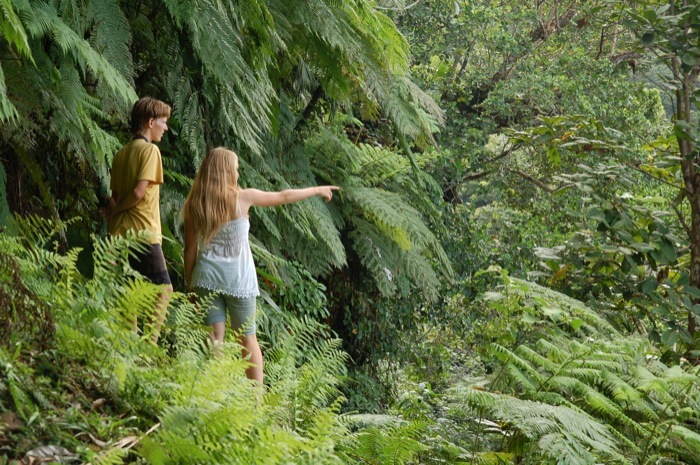 Perhaps it might even get Nevis onto that list of Places-You-Just-Have-to-See. Drop by in a fortnight for Part V of this article. The British invasion of Anguilla in 1969 included mostly paratroopers, but they were ferried ashore from ships of the Royal Navy. No one dropped from the sky. This myth is being picked up and repeated far and wide. Please do not spread it any further. Hi Bob, thanks for your comment.